Picture of: one of the five tables we made up for our eldest's (un)graduation party tonight. 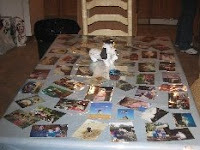 We had some 300 pictures of her life all spread out on the tables underneath a clear-plastic table cloth. Lots of memories. Today I: prepped, presented and attended my daughter's party with 30 members of our family. Good times. Picture ideas was good for conversations and memories. 18 years of unschooling. Excellent. Congrats, Katie. 05.28.2008 Wednesday: Swing. Of Things. 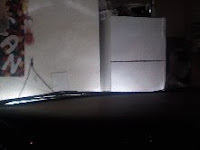 Picture of: view through the front window of my van as I pull into the garage at my house, finally done for the day. 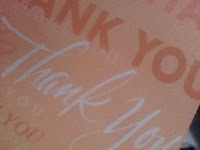 Picture of: front of thank you card my eldest daughter got from the owner when said daughter found wallet in parking lot at work and turned it in. Owner was, apparently, profoundly happy to have her wallet back. Today I:In the last few days I: have missed updating you; had a bad FMS day and fell behind a bit; Twittered; wrote blog posts; bought airlines tickets to multiple destinations; talked with sponsors on the phone; booked school shows; didn't book other shows; started an outline for the next book; had lunch with a person who might be able to do a cool workshop with me; had a huge, historic-type storm in AZ today; booked hotel reservations; booked rental car reservations; talked at length with other national storytellers; called the A/C guy to come fix my air conditioner; chased my kid's rats out of my office (you didn't expect that one); drove around parking lots with learning-to-drive learner's permitted child; ordered pizza; re-evaluated and made some tough decisions and started to move forward; thanks for being with me on this blog-more to come; happy birthday to my brother Mike. 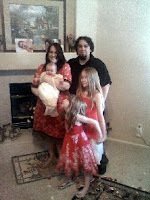 Picture of: my sister, her husband and three daughters after the Welcoming Ceremony (note rose petals all over the floor) for their new baby- at my folks house today. 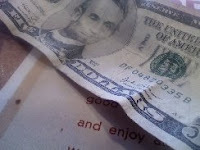 Picture of: tip left on a table for one of my meals as of late. Today I: want you to know I am still here. Many new things happening all at once, many old things being let go of. Picture of: the sign at the gate of the Austin airport. 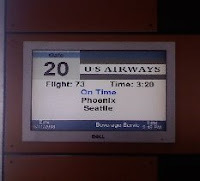 The flight was actually delayed about 30 minutes, but hey, who is counting? Today I: took in a few extra winks of sleep; packed up my things and checked out of the hotel; ate lunch at Denny's next door with many families celebrating Mother's Day; returned the rental car; hurried up and waited for the plane to take me home; flew across the southwest, collected my things and made my way home; hung out for a few moments at my mother's house for the tail end of the family party; sent and email to a corporate storytelling client; took a nap; wrote an article for Storytelling Magazine; chatted with Dianne on one of them late night phone calls; made a huge giant commitment to a new program that will open up new horizons, I believe; happy Mom's day to the mother of my children and also to my mother. I love you both. 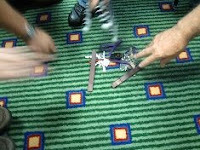 Picture of: fast-moving hands in a small group activity during the "Storyteller.net Live!" workshop in Austin, Texas. 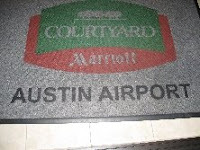 Picture of: the welcome mat the airport where I am staying tonight and we're having the workshop on Saturday. 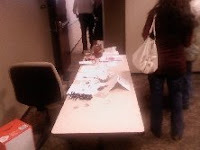 Picture of: the sign in table, after lunch. 05.06.2008 Tuesday: Shh. I am on the phone. 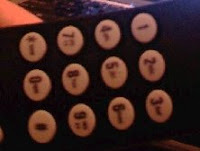 Picture of: my office phone. 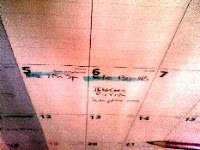 Picture of: the calendar I was working on with my wife today. 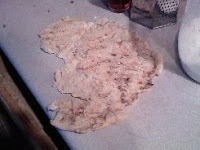 Picture of: the remaining pizza crust, sans toppings post canine. 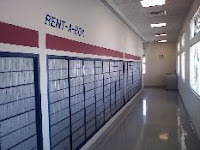 Today I: did a phone interview regarding storytelling with a major magazine; if you have taken the Outside In Marketing Camp, you know what happens when the press calls; ran to the bank and the post office; hand made four pizzas, all scratch, for my family dinner. Went upstairs to check on something. When I came back I now had three pizzas and one that had been stolen off the counter by the new dog, taken out to the backyard, licked clean of toppings and left chewed and destitute. Bad (BAD!!) Dog. Another work of art destroyed by a dog. Bad Dog. But he is sooo cute; answered a forum post; watched BSG and called it a night.